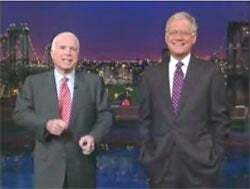 Here's the unusually-good-for-political-late-night-appearances McCain-Letterman dis-off from last night; click the pic to watch. It's funny because I actually think that most dudes would fall into the category of "guys who like hot tubs specifically for the purpose of watching their swim trunks inflate." (Like, I think my dad does that.) What that means, I am not sure.